CAPE TOWN, South Africa — A law to regulate intellectual property derived from research and development conducted using public funds has boosted the number of patent applications filed and granted by universities and research institutions in the past five years. South Africa previously had no law to regulate intellectual property emanating from research and development conducted using public funds. The Intellectual Property Rights from Publicly Financed Research and Development Act (IPR Act) came into effect on 2 August 2010. “Over the last five years or so the number of disclosures received by an office of technology transfer has almost tripled, with the number of granted patents being managed by an office of technology transfer doubling,” said Kerry Faul, head of National Intellectual Property Management Office (NIPMO), the implementing office for the IPR Act. According to Faul the number of licence agreements signed has tripled and the number of start-ups quadrupled over the same period. “NIPMO has received over 1000 disclosures from institutions of which 71 percent are inventions, 5 percent have been licensed and over R2.5 million (US$174 000) in revenue has accrued to the institutions,” she told Intellectual Property Watch. 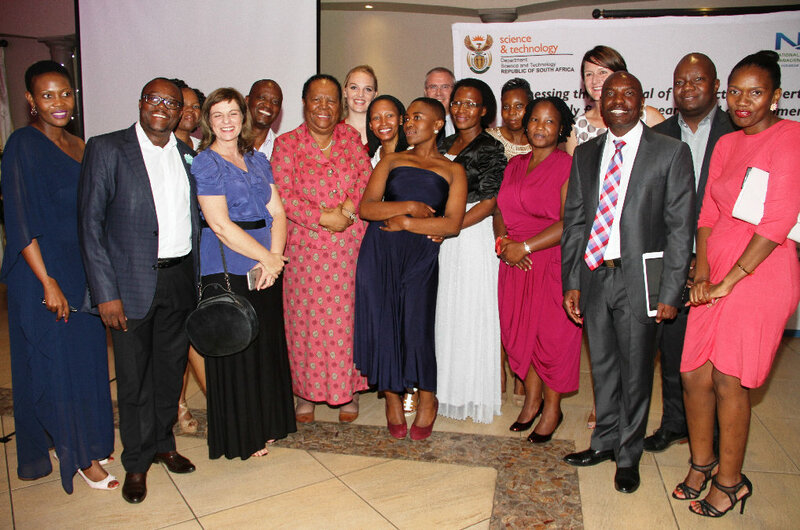 The law backed by South Africa’s Department of Science and Technology (DST) aimed to ensure improved management of IP originating from publicly financed research and development (R&D). Statistics for 2012-14 indicate that the government was the largest funder in public institutions for R&D expenditure. The IPR Act guarantees identification, protection, use and commercialisation of intellectual property arising from publicly financed research and development to benefit of South Africans. The inventions range from social and economic to military amongst others. It also regulates small businesses that are recipients of public funds. The law outlines the minimum benefits to be given to researchers if IP which they have developed is successfully commercialised. Of the first one million Rand of gross revenues, IP creators receive a minimum of 20 percent and subsequently, they receive 30 percent of net revenues. The law obliges the government to meet the exorbitant costs of patent applications. The IP Fund pays up to 50 percent of the IP prosecution and maintenance costs incurred by an institution. The South African law is modelled on the United States equivalent Bayh-Dole legislation. One could ask five years later, is the law serving purpose? Faul says it was critical to have this law because large amounts of public funds were being spent on research and development, but the translation into products, processes and services was observed as being low. “We were finding that when IP was being developed which had the potential for resulting in a product, process or service, the IP was being shipped offshore and as South Africans we were not benefitting from the IP and instead were faced with the possibility of having to pay again to access the resultant product, process or service,” she said. McLean Sibanda, chief executive officer, The Innovation Hub, Africa’s first internationally accredited science and technology park based in Pretoria, says a review of the state of IP management prior to the IPR Act showed that there were discrepancies in IP management amongst universities and other public research institutions. He says this made contracting by industry with these institutions unpredictable and at times, these institutions gave away the IP to industry without regard to incentivising the researchers through benefit sharing arrangements. “At the time, some of the public funding institutions insisted that IP they funded was owned by them – a situation that is not ideal, as government should not really own IP without capacity to commercialise it,” Sibanda told Intellectual Property Watch. As such the IPR Act has provided uniformity in terms of an approach to managing IP emanating from publicly financed R&D, such that whoever is funded owns the IP but has an obligation to commercialise it for the benefit of the people of South Africa, he explains. Sibanda, who is also an IP expert, says the researchers, inventors or IP creators now have an entrenched statutory entitlement to share the benefits accruing from commercialisation of the fruits of their ingenuity. “In passing the law, it was also recognised that the extent to which the universities would generate IP would differ and as such, the IPR Act required designation of the functions of managing IP to a function within the university,” he added. Faul says the IPR Act required that institutions, the 26 public universities and 10 research institutions to have an office of technology transfer (OTT), designated individual or regional structure within 12 months of the coming into effect of the law. 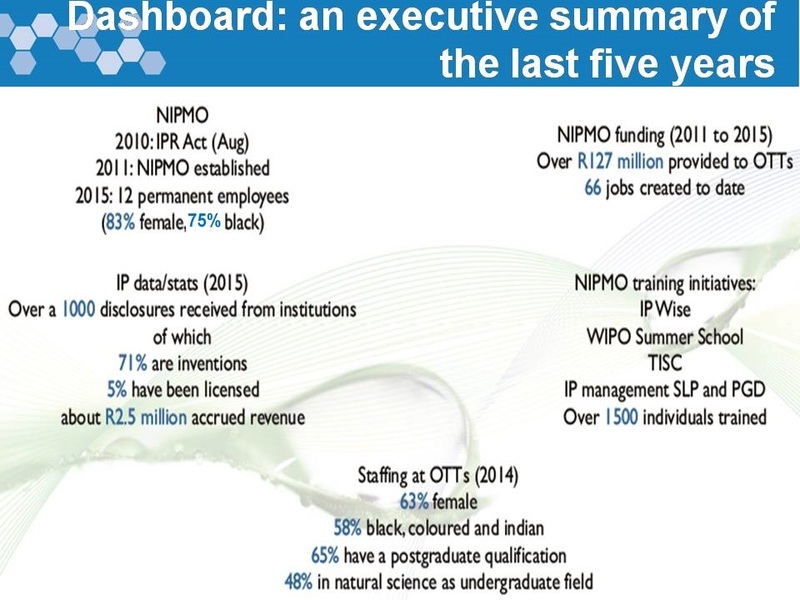 Through the OTT Support Fund, the NIPMO helped institutions to recruit and train workers where there were staff shortages, resulting in creation of 66 posts at institutions. Jacqueline Barnett, Innovation Office director, Nelson Mandela Metropolitan University, South Africa, says the tremendous effect of the law has been in making researchers and universities more aware of IP issues and more aware of the need to show the impact from their research. She says this ensures that public funds spent on research can make a difference in the lives of South Africans. Barnett thinks five years down the line is still early for South Africa to reap real economic benefits of the law. “Commercialisation of intellectual property takes many, many years, certainly more than five and probably more than ten,” she said. Sibanda agrees that there has been an increase in IP awareness, as well as in the number of patent applications filed and patents granted to universities and research institutions and more innovation projects. “IP is component of innovation and the extent to which the IPR Act is able to catalyse innovation is also dependent on the other component of the ecosystem such as ability to commercialise, which is a different set of skills. That having been said, yes, we are seeing more innovations coming out of the universities, particularly the research intensive ones,” said Sibanda. Sibanda cautions on expecting dramatic economic results in a few years since the Act was passed. “Our innovation ecosystem is adapting incredibly well and what we have seen is more start-up companies, more licence agreements. Commercialisation by its very nature is an arduous process that may take anything from 3 to 12 years,” he said. As an example, he cites the lithium-ion battery technology developed at the Council for Scientific and Industrial Research (CSIR), which only attracted revenues after 12 years of the patents having been filed. “Had CSIR made a decision not to renew the patents, no revenues would have accrued to the CSIR. Today, this has been one of the most successful commercialisation stories of innovations coming out of the public research institutions,” he said. Yet, another example Sibanda cites, Professor Vivian Alberts’ photovoltaic technology developed initially with public funds and first licenced to the Germans around 2008, had to undergo various adjustments before full-scale production and real revenues coming out in addition to the initial licence royalty income. He says there are a number of very promising technologies and IP that have been developed in the past few years some entering clinical trials or now requiring larger amounts of funding for commercialisation. These include the TB SmartSport by the University of the Witwatersrand, Marti TB Diagnostics by the University of Pretoria among many others. The intention of the law was not for the government to appropriate researchers’ IP for its own national uses, but that can happen if the IP was not declared and it comes into conflict with the IPR Act, says Sibanda. It can also happen if the IP was not commercialised within a reasonable time, and NIPMO is of the view that there are commercialisation prospects and has identified a partner that may commercialise such IP, he adds. He says the regulations in terms of which government may appropriate the IP for its own national interest are crafted in such a way as to be difficult for the state to unilaterally and without consultation, access such IP anyway. “Whereas the USA equivalent Bayh-Dole legislation has similar clauses which are typically called ‘walk-in rights’, such provisions have never been used to date. They are however a useful lever to ensure that where the public funds R&D, the resultant IP must be commercialised and not just sit on the shelves,” Sibanda said. Faul observes that sharing of benefits is positioned a bit late in the innovation value chain to act as a huge incentive to ensure researchers make disclosures. A researcher will only receive money once revenue accrues to the institution for commercialising the invention. As a solution, Faul suggests that there is a need to create incentives early on in the innovation value cycle so as to offset the desire by researchers to publish only, in order to enable publishing and protection at the same time. Generally, the experts agree, the huge benefit has been raising profile and level of awareness about IP resulting from this piece of legislation. “We are finding that institutions who never protected their IP are now doing so, and institutions who filed patent applications for any disclosure that crossed their desk are now more savvy in their ability to discern between what they believe will be a blockbuster and something that will never see a factory floor,” said Faul. More researchers are aware of the need to look after IP and also in engaging with external parties, they seek assistance where they are not clear, says Sibanda. “This on its own is a great achievement of the IPR Act, as knowledge and intellectual property are the main currencies for today’s globally connected knowledge based economies,” he said. While the law is a good management tool for IP at publicly funded institutions because of increased knowledge, funding and awareness, it’s not necessarily applicable everywhere. “I am not sure that can be extrapolated to South Africa as a whole,” Barnett said. However, as South Africa shows strength in utilising IP from publicly funded institutions, it still needs to catch up globally. According to the 2015 Global Innovations Index by Johnson Cornell University and the Wold Intellectual Property Organization, South Africa slipped in the global innovation rankings, but remains one of the most innovative countries in Africa. Ranked as the 60th most innovative country in the world out of the 141 countries, down from 53rd in 2014, South Africa is the second most innovative country in Sub-Saharan Africa – below Mauritius at ranked 49th. "Law Boosts Awareness, Patents From Research Institutions In South Africa" by Intellectual Property Watch is licensed under a Creative Commons Attribution-NonCommercial-ShareAlike 4.0 International License.